You'll be £12.00 closer to your next £10.00 credit when you purchase Waterloo: The Campaign of 1815 (II). What's this? The concluding volume of this work provides a fresh description of the climatic battle of Waterloo placed in the context of the whole campaign. It discusses several vexed questions: Blücher’s intentions for the battle, Wellington’s choice of site, his reasons for placing substantial forces at Hal, the placement of Napoleon’s artillery, who authorised the French cavalry attacks, Grouchy’s role on 18 and 19 June, Napoleon’s own statements on the Garde’s formation in the final attack, and the climactic moment when the Prussians reached Wellington’s troops near la Belle Alliance. Close attention is paid to the negotiations that led to the capitulation of Paris, and subsequent French claims. The allegations of Las Cases and later historians that Napoleon’s surrender to Captain Maitland of the Bellerophon amounted to entrapment are also examined. After a survey of the peace settlement of 1815, the book concludes with a masterly chapter reviewing the whole story of the 1815 campaign. Wow... magnificent! 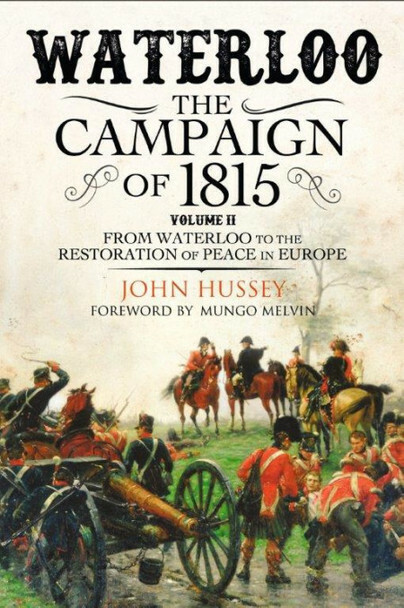 I just finished volume two of John Hussey's mighty, epic two volume history Waterloo, The campaign of 1815. What a great literary-historical journey it was. In summary I cannot over state how much I enjoyed this book. What other authors have brought into a spotlight Hussey has brought into the sunlight. Not only do we see an event illuminated we also see the context by which and in which it has relevance. If you want to understand Waterloo you have got to read this book. A masterful study of command, control, communications, and even intelligence of all the major combatants during the Waterloo Campaign. Destined to become the gold standard for those studying how armies were controlled and decisions made during the Waterloo Campaign. After reading History at Cambridge John Hussey spent 30 years working for BP around the world including the Congo in the 1960s and Nigeria in the 1970s. He was awarded an OBE in 1971. He has written many articles on British military history, mainly on the Napoleonic and First World Wars, and served as a member of the International Historical Committee for the restoration of the Waterloo Battlefield. He is the author of MALBOROUGH: HERO OF BLENHEIM (Weidenfeld & Nicolson, 2004) and is a Fellow of the Royal Historial Society. Hew Strachan is Professor of International Relations at the University of St Andrews and was formerly the Chichele Professor of the History of War at All Souls College, Oxford.